There are two methods for indicating protection relay functions in common use. One is given in ANSI Standard C37-2, and uses a numbering system for various functions. The functions are supplemented by letters where amplification of the function is required. 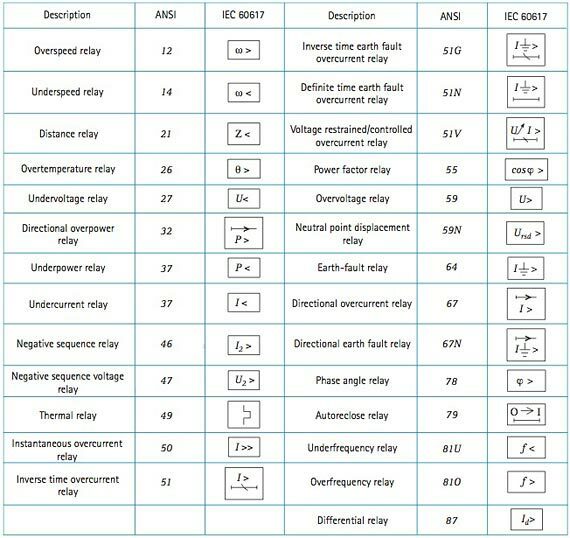 The other is given in IEC 60617, and uses graphical symbols. To assist the Protection Engineer in converting from one system to the other, a select list of ANSI device numbers and their IEC equivalents is given in Figure A2.1.